In week four, the Warlocks continued building our 2018 robot named OTIS! 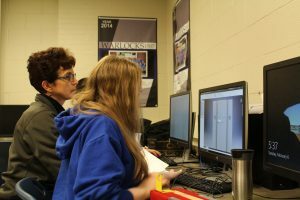 Working together, the programming team has learned programming through the help of professional programmers Kris Sielski of Sensorcon, Ken Handley of New York Power Authority, and Tim Brounscheidel of GM Powertrain. Students Andrew P., Faith O., Jared M., Cory M., Ben L., and Kyle P. went to MAHLE over the past 6 months to learn a program called C++. This program has been implemented into our 2018 robot and has been extremely successful. The progress that our students and mentors have been making has resulted in a robot that is currently able to autonomously move, stop, turn, and it has the ability to come within 1/64th of an inch of the designated stop. Our hats come off for how far our students have come over the last 6 months in programming. -Jim Rogowski, President of Lockport Robotics Inc.